I possess a background in all levels of government and in business with solid skills in consulting, project management, training, finance and accounting, and management. My wife Billie and I joined Bungadoo Rural Fire Brigade in October 2012, soon finding myself in the position of Treasurer, where I have remained ever since. 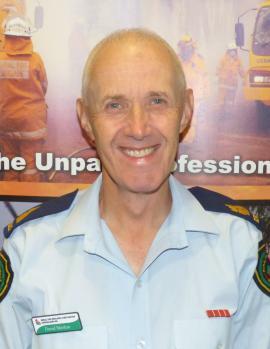 I became the Brigade’s 2nd Officer in October 2013, 1st Officer in October 2014, and hold other positions as well including Fire Warden and Volunteer Community Educator. Since joining Bungadoo I have focused on increasing our level of activity in the area and our engagement with neighbouring brigades. I have worked hard to improve the experience of our volunteers by implementing changes that make sense, while improving overall safety. Wins along the way include improved brigade vehicles, larger and more volunteer-friendly facilities, and a water filling station at our dam that has already proved its value. I now look forward to working with all of our area’s brigades!